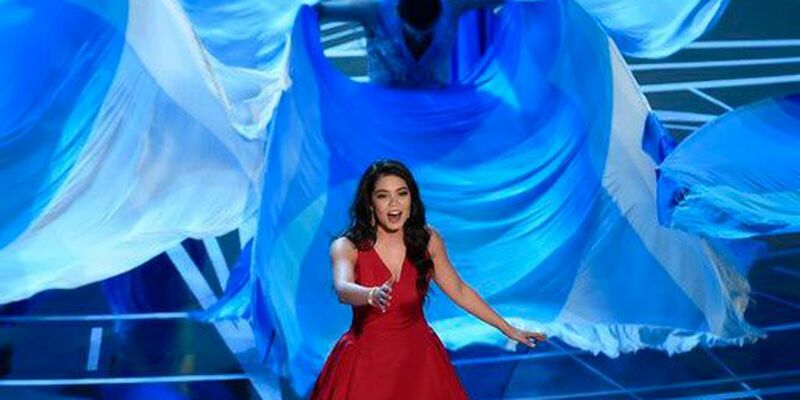 HONOLULU (HawaiiNewsNow) - "Moana" star — and Hawaii high school student — Auli'i Cravalho lit up the Oscars stage on Sunday night, performing a full-throated rendition of the Oscar-nominated song, "How Far I'll Go." Cravalho, 16, joined "Hamilton" creator Lin-Manuel Miranda to perform the song for the hit film at the 89th annual Oscars in Hollywood. Miranda delivered an original rap prologue for the song before handling the spotlight over to Cravalho. The two were introduced by "Moana" co-star Dwayne "The Rock" Johnson. Cravalho got high praise for her performance, not least of which because of how she handled being hit in the head with a ribbon twirler's flag prop (meant to symbolize waves) during the song. "The newcomer — already a pro — barely flinched," wrote Variety magazine. Fans quickly took to social media to praise Cravalho's older-than-her-years professionalism and talent. On Cravalho's Facebook page, fan Phoebe Alexander wrote, "The way you held it together when you got hit in the head — I almost thought I had imagined it. You are amazing!" Another fan wrote, "I am absolutely floored at the talent and poise at 16." Also performing at the annual awards show were Sting, Justin Timberlake and 2014 Oscar winner John Legend. By the end of the night, "Audition" from "La La Land" had clinched the Oscar for best original song. But the performance of "How Far We'll Go" was creating far more buzz. Show producers Michael De Luca and Jennifer Todd said the night's performances were meant to "not only celebrate the five extraordinary nominated original songs, but also the integral part music plays in movies." Miranda is best known for creating and starring in the Broadway musicals "Hamilton" and "In the Heights." Meanwhile, Timberlake performed his Oscar-nominated song "Can't Stop The Feeling" from the movie "Trolls" and Legend performed "Audition (The Fools Who Dream)" and "City of Stars," from "La La Land."